ArCHchart™ is the missing ingredient in your Client management applications. It allows you to simply, swiftly and easily update the present status of where your firm is at in your Clients’ projects, without cumbersome scheduling software. It also helps educate your Clients as to the architectural project process: What Comes Next? It does your talking for you, helping your Clients understand why you’re doing what you’re doing and the relative amount of project time devoted to each phase and interconnected activities in a simple, colorful chart format. This is the webpage for the ArCHchart™ (architectural project process and progress application). $85 ArCHmembers, $175 non-members (join ArCH and reduce your cost). NOTE: this application is now part of the new ArCHsuite™, which offers an even deeper discount than if you bought this application as offered on this product page. See ArCHsuite for the best possible bundled deal. 1. The Architectural Project Process. 3. Client role in the project. 4. Where the project is right now in the process. To help Clients feel more comfortable with the project process, allowing them to relax and enjoy it, reducing stress, being able to plan. Note: this form is actually several pages long. This is only Page 1. A rigorous schedule. No precision is suggested. It depicts sequencing and relative proportions of time in each phase with respect to other phases. This is intended to be simple to use and understand. However, if you want, you can certainly add all the formulas and formal scheduling formatting you desire: that’s up to you to add, if you wish. Imagine your Clients, for the first time, ever, actually understanding where you are at in the traditional architectural project process and why and knowing what’s next. Never had that experience before? Typically have Clients that are confused by the architectural process and wondering why you are doing what you’re doing and why they should pay you for that? ArCHchart™ helps fix that. It explains, in simple bar chart format, what’s going on and what comes next. SAY YOU DON’T WANT TO GET STUCK UPDATING COMPLEX SCHEDULING SOFTWARE? You won’t. That’s not what ArCHchart™ is. It is about relative proportions and sequencing, not specific calendar days. WANT APPLICATIONS THAT ARE EASY TO MODIFY TO SUIT YOUR OWN PRACTICE? ArCHchart™ was created in MS Excel. What could be easier? Drag and drop. Move. Delete. Insert. Simple. Client engaging their Structural Engineer. Certainly, the ArCH AOA™ (Architect-Owner Agreement) requires your Client’s consultants to review your company’s list of Survey and Geotechnical requirements and requires your Client’s consultants to coordinate with your firm to your satisfaction. If you’d prefer to run these high-liability 3rd party services through your firm, you certainly may; Architects have for decades. However, legal counsel to ArCH and many or our members have indicated that it is far wiser to have your Clients directly engage those services with you assisting in coordination. The ArCHchart™ is coordinated with other ArCH applications, Such as ArCH AOA™, ArCH-SurveyReq™, ArCH-GeoReq™. By indicating these line-item Client-consultant engagement points along the ArCHchart™, hopefully your Clients will be more prepared and expecting these actions as they move through the architectural design and documentation process. And helping to manage Client expectations is one of the main reasons ArCHchart™ was created. ArCHchart™ can help. How? Your Clients may simply not understand where they are in the project. 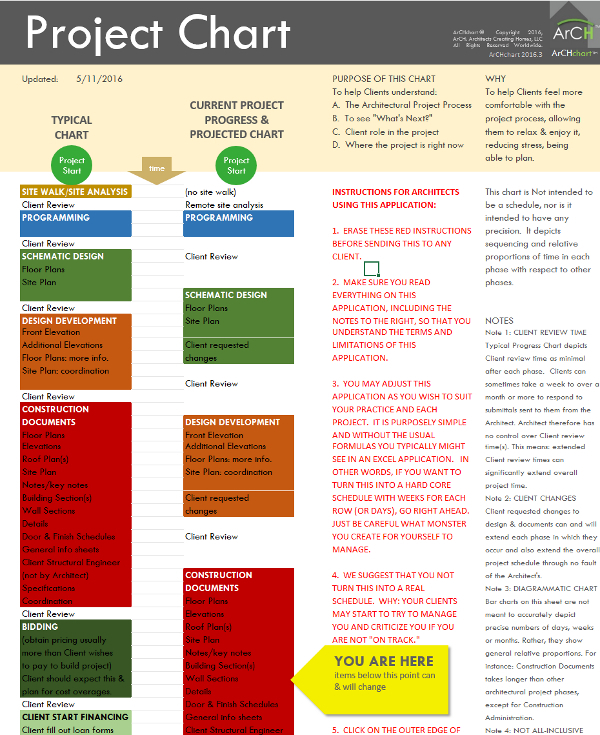 ArCHchart™ provides them with a clear view of YOU ARE HERE in the project process. Your attaching a PDF of an updated ArCHchart™ to each of your invoices helps your Clients to understand how far along you are and if this seems reasonable. ArCHchart helps you explain the architectural process to your clients in an easy to understand colorful bar chart format. Also, ArCHchart clearly indicates YOU ARE HERE on the chart so your clients can see where their project is in the progress of your project. And this chart also has each portion of the bar sized proportionately so your clients can graphically realize that CDs (Construction Documents) will typically last much longer than Programming, or Schematic Design, for instance. And that construction will take longer. But because ArCHchart is created in MS Excel, you can modify it to suit your own practice, or use it as is; the choice is yours. Never before has there been an electronic tool that easily and quickly explains the entire architectural project process to your clients like this. Chart continues through Bidding, Construction Administration, Warranty Period and Post Warranty phases. Also includes Client Financing steps, Value Engineering and has a host of on-screen notes to aid in explaining the implications of client actions on their project. Once you start using ArCHchart, you’ll wonder how you ever got along without it.